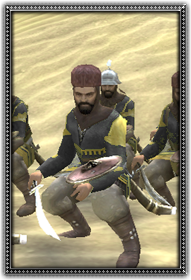 The Muslim Swordsmen are highly religious men . Highly disciplined and trained, these troops fear little and are masters of ambushes. On the battlefield they fight with sword and shield, as opposed to the daggers of their trade. Having no fear of death makes these men especially deadly.